490.00 EUR max. 3 Pers. There are overflown, depending on weather and desires of the passengers, Gelbensande, Dierhagen, Wustrow, Ahrenshoop, Darßer West beach, lighthouse Darßer. 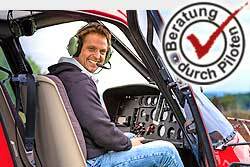 With booking the whole helicopter you can discuss the route on the spot directly with the pilot. The route is dependent on the weather and of course aviation safety, otherwise the pilot attempts to fulfill your wishes in compliance with the flight time.